I have been lucky enough to see wild white rhinos in the bush of Kruger National Park, where I was awestruck by their presence. Yet sadly, I have also seen the incredibly distressing footage of a rhino breathing heavily as it slowly bleeds to death because its horn has been brutally severed to supply the demand for this product in China and Vietnam. Recently I had the privilege of meeting enforcers who are at the front lines in the fight against the rhino poaching crisis in South Africa, and I was truly inspired to see first-hand the commitment and dedication of these enforcers to catch those who seek to profit from killing South Africa rhinos and elephants. As IFAW’s Global Wildlife Cybercrime Project Lead, I have headed up a team of experts researching the scale and the nature of wildlife trade over the internet in more than 20 countries. 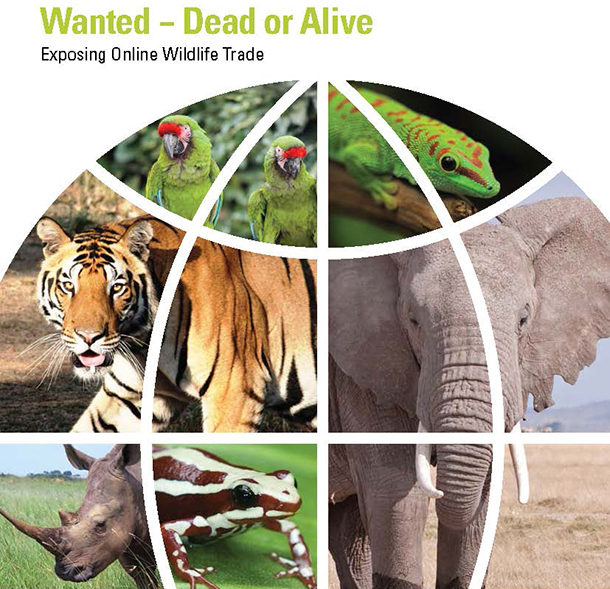 Our 2014 investigation Wanted – Dead or Alive: Exposing Online Wildlife Trade found more than 30,000 endangered and threated live wild animals and items made from their body parts available for sale across 280 online marketplaces in 16 countries over only just six weeks. The internet clearly provides access to a massive market for those trading in wildlife that is open 24-7, all year long. The challenge for us, however, is identifying which of these traders are operating illegally as legal trade in wildlife is permitted under certain conditions. This is where enforcers come in. They can apply their investigative techniques to look at suspicious traders online and distinguish the legal traders from the criminals who are making a business out of illegally trading in endangered wildlife. IFAW has been supporting enforcement efforts across the globe for years to ensure that police and customs agencies have the skills and the knowledge to find these criminals and we are now seeing more and more reports of wildlife cybercriminals being brought to justice. Having the opportunity to share IFAW’s expertise in combatting online wildlife crime with South African law officers during a four day training workshop, I was hugely impressed by their professional and personal commitment to ensure that the poaching epidemic is stopped in its tracks. It was an honour to be able to deliver this training alongside the Endangered Wildlife Trust which has brought local knowledge, contacts and expertise to the table. Without this group’s cooperation, this entire project would not have been possible. The images of poaching, including an orphaned rhino calf in distress next to its recently killed mother, do keep me awake at night. But I know that we are making significant inroads into finding those who use the internet to trade illegally in endangered wildlife, so that these horrific incidents become less frequent and hopefully disappear altogether.